Indoor plants need lots of regular care and attention from their owners, be it through watering, re-potting or merely keeping them in the right conditions. By following the guidelines below your life and that of your plants, will be stress-free. 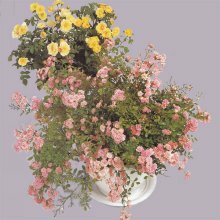 Plants need light, although the amount varies between varieties. 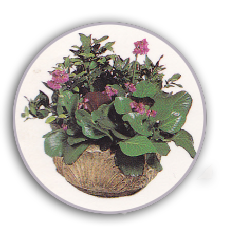 Flowering houseplants, or those with colourful foliage (such as African Violet, Freesia and Cyclamen) thrive well in places where there is lots of light. In contrast, Birds Nest Fern and Devils Ivy prefer shady corners. Keeping your plants in the right temperature is also important. Again, preferences for temperature vary between plants, so check their individual requirements. In general, during the winter months keep plants away from warm heaters or fires. Water is, of course, one of the essential requirements of plants. Knowing exactly how much water to give can be a problem and many people often over-water. The main point to remember when watering is to ensure you give the plant a thorough soaking - a good guideline is to stop when you see water draining through planters into their saucers. If any water remains in the saucers after half an hour, then empty them and allow the planters to drain. To avoid over-watering, don't water too frequently if the soil in the pot is moist the plant does not need more water. Ensure that the planters your plants are in, are the right size. Don't leave large plants squashed up in small planters if they have outgrown their original planters transfer them to new larger planters. Re-potting is best carried out in either early in the spring or early autumn. Deadheading your plants allows new growth to occur so check and remove any dead flowers. Plant foliage picks up house dust, so giving the leaves a quick wipe occasionally with a damp cloth helps brighten up the plant.